With life as an empty-nest parent looming and her remarriage to former BYU basketball star Stephen Craig still in the honeymoon phase, she’s ecstatic about quality-time getaways. “We’re actually going to go,” said Osmond, in a wide-ranging, revealing interview during “Conversations with Norm” on Saturday. “We’re going to do all the things that matter,” Osmond told a near-capacity at Cabaret Jazz at the Smith Center for the Performing Arts. Osmond and Craig remarried in 2011 after divorcing 25 years earlier. 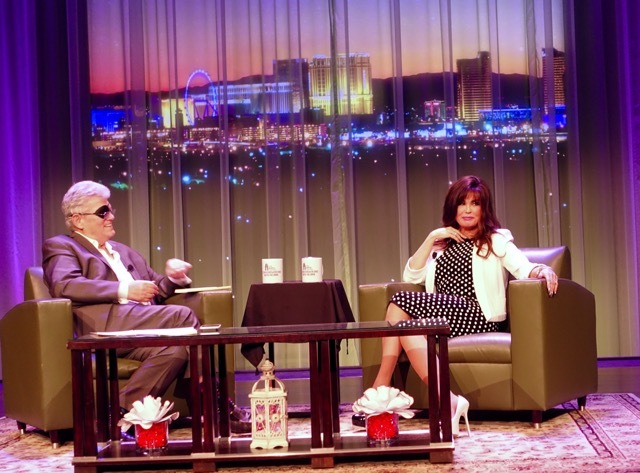 Osmond hinted she and her brother are leaning toward extending the Donny & Marie show at the Flamingo. Their 10-year anniversary was a year ago. And she has another Broadway-related project in the works. “I’m doing a new album more Broadway opera-based,” said the versatile entertainer whose career has spanned country, pop and Broadway musicals. She shared her incredible highs and lows, from a No. 1 hit (“Paper Roses”) at the age of 12½ to marital and financial setbacks. At the age of 40, postpartum depression nearly resulted in her driving her car off a cliff along the Pacific Coast Highway. Don’t let the signature ever-sunny smile fool you, she’s a tough-minded survivor. Nothing illustrates that more than her story about the day Donny accidentally ice-skated over her finger during the first incarnation of the “Donny & Marie” show in the 1970s. Osmond told the audience, “I remember thinking I don’t matter. That's what you kind of think, I am not important. She drilled through the fingernail to relieve the pressure. “Blood squirted everywhere,” she said. “You get tough,” she said, adding she’s no “wimp. I’m pretty tough, I think, from growing up with brothers. My dad always told me he was grateful he had one son,” she said, to laughs. She drew on her inner strength when she encountered sexual abuse, mental abuse and a severe case of postpartum depression. “I was sexually abused as a child and I believe that’s a real high component in (depression). Never spoke about those things. I never wanted to humiliate my family or let them know. And as a child, one of the reasons I loved being on stage was that it was safer than being backstage. She had turned over her infant to her nanny in Agoura and drove 250 miles up Pacific Coast Highway to try to figure it out. “I found myself in a no-tell motel. I knew that because they had toilet seat covers in the bathroom,” she said, never at a loss for a quip. She got a call from her mother, who had tracked her down through her credit cards. The worst of the mental abuse came one day when a producer for the “Donny & Marie Show” (1976-1979) marched her outside to address her fluctuating weight. That led to crash dieting, and her weight dropping to 93 pounds. She also overcame a financial calamity. “I was 19 years old and all the work we had done, and I don’t know if this was interesting, but I was financially set for life. Me, my kids, my grandkids, their kids, everybody was set in my family. “Then my brothers did some business and they lost everything. The scene and heard R&R Partners, Inc., had a camera crew in Hugo’s Cellar (Four Queens) recently, shooting a campaign commercial with a stunning model. The largest advertising agency in the state is responsible for promoting Las Vegas through the Las Vegas Convention & Visitors Authority. On this day… July 4, 1981: The Hole in the Wall Gang, run by mobster Tony (the Ant) Spilotro and specializing in robbing hotel rooms of rich gamblers, is caught breaking into Bertha’s, a Las Vegas furniture and jewelry store, after one of the gang rats them out. The Mob has Spilotro killed five years later. At Red Rock’s T-Bones steak house a week ago: actor Kevin Costner and his family at an event that included football legends “Mean” Joe Green and Franco Harris of the Pittsburgh Steelers’ 1980s dynasty and Jim McMahon, former BYU and Chicago Bears standout.